Reading Civil War pension files is a quirk I have. Over the years I have collected quite a number of them. Most are for Native Americans. The story these files tell about the men (or the widow they left behind) who were willing to sacrifice it all for their country are all too frequently extremely sad. The pension file for Lewis Kindness is no exception. His pension file does not provide any information of use to my Kanistanaux project. However, I have a soft spot for soldier’s stories (a disclaimer in case you haven’t figured it out yet) and I have a blog. So, dear readers, I have the privilege of telling this soldier’s story. I want to thank Caroline K. Andler of the Brothertown Nation for sharing Lewis’ Pension file with me. I also want to thank her and Andrea R. Brucker for the wonderful work they did in producing a book titled Letters Home From The Brothertown “Boys”. Caroline gifted me with a copy last month. It is a most wonderful book which I highly recommend to anyone interested in Civil War history. They did an absolutely wonderful job of transcribing dozens and dozens of letters written by Brothertown men. They have also compiled biographies of the companies the men served in and for many of the individuals. A nice finishing touch is the inclusion of some wonderful photos of the “boys”. P.S. If you click on the book title, you will be taken to Amazon.com where you can purchase a copy and Ne-Do-Ba will receive a small percentage of the profit as an Amazon Affiliate. Lewis M. Kindness (also found as Kiness) was born into the Brothertown Indian Nation on 4-Sep-1838 [or 1839 or 1840] at Brothertown, Oneida Co., NY. His mother’s name is Phebe Kiness. Lewis’ father’s name is unknown. Phebe Kiness is a sister to James J. Kiness, the father of Laton & Isaac Kiness / Kanistanaux. Lewis was the younger brother of James Henry Kiness. James served two enlistments during the Civil War. He served from 31-May-1861 to 16-Jun-1864 in Co. K, 1st Kansas Volunteers. He then reenlisted and served from 2-Sep-1864 to 2-Jun-1865 in Co. C, 38th Wisconsin Infantry. He worked as a brick mason after the war. James filed for a military pension 3-Jan-1887 and died in Wisconsin 1-Oct-1909. Phebe, with sons James and Lewis are found as a Brothertown family on a document dated June 8, 1841. The family moved from New York to the new Brothertown settlement in Wisconsin about this time. Eleven year old Lewis appears in the Wisconsin 1850 Census household of Phebe Fowler, age 77. It is rather odd that Lewis is listed as mulatto, while the head of household and all the other Brothertown Indians listed in this Indian community have no color listed. What set Lewis apart from all the others? Perhaps this is just another census taker opps. The head of household this year is very likely his re-married and again widowed grandmother. His brother James has not been located in this census. Nothing more is known about Lewis’ time growing up, but documentation suggests he did not get a formal education, which is unusual in the Brothertown community. The following timeline for Lewis’ service during the Civil War has been compiled from a number of resources as listed in the bibliography at the bottom of this post. Some information is conflicting. Items in bold come directly from War Department research notes contained in Lewis’ pension file. the regiment participated in the Siege of Yorktown and the Battle of Williamsburg in April and early May 1862. At Williamsburg they honored themselves for their bravery and discipline under fire. Lewis’ company lost two men killed and 10 wounded. His regiment lost 11 killed, 68 wounded, and 1 POW. A 1904 letter in his pension file states. Lewis was returned to his regiment 6-Nov-1863. His regiment was participating in the Battle of Rappahannock Station in which they suffered heavy casualties. It is doubtful Lewis actually took part in this. Lewis was wounded by a spent ball, on 1-Jun-1864 during the Battle of Cold Harbor. In mid July of 1864 a portion of the regiment was ordered home while the remaining Veterans re-organized into an Independent Battalion of 3 companies. That’s all I have for records of his service. It appears Lewis was sick off and on in the fall and following spring of 1861-62. Let’s hope he was not one of the men of the 5th Wisconsin I learned were poisoned by their own Doctor. I found the following story online at the Wisconsin Historical Society. On March 12, 1862, a group of sick soldiers of the 5th Wisconsin Infantry lined up outside the surgeons quarters in Alexandria, Virginia, to receive medicine. Dr. Charles Crane of Green Bay administered what he thought was a large dose of quinine to each patient. But when they began to collapse he learned the vial contained morphine instead. This is how soldiers medical needs are handled during the Civil War. They become sick or wounded and need care. They are sent to the hospital. If they need too much care they are discharged or furloughed home to recover. This probably worked out fine for those men that had someone to go home to. I am sure home was superior to an army hospital. But even home has problems. A caretaker is saddled with the expense of food and care while the soldier has no income and is unable to provide for himself. For Lewis, going home was not such a great option. In hind sight, it may have cost him his pension in later life. His mother and grandmother are gone, his father unknown, and his unmarried brother is in the army. Lewis has no one to go home to. Before long he is in the poor house. Somewhere along the military line, someone decides Lewis is gone without permission or has overstayed his furlough and they declare him a deserter. Eventually, the military goes looking for him and finds him in the poor house in Wisconsin. From here they whisk him back to duty. Here’s my thought – if he is not recovered enough to support himself, how could he possibly be fit enough to return to active duty? Lewis believed he had been discharged. Would Lewis have allowed himself to be subjected to the poor house if he understood he could return to the hospital or his regiment? At least in the army he would collect pay now and then and be supplied with food and clothing. If this first desertion charge had never existed, Lewis may have had better luck getting his pension the first time he applied. At the very least, he would have had extra years to be dealing with the other issues blocking his pension while more of his fellow soldiers were still alive to testify for him. Caroline Andler’s book Letters Home From The Brothertown “Boys” contains one letter from Lewis written on the 28th of April, 1864. The letter was probably written by a fellow soldier since Lewis was unschooled and the letter is in a nice hand. They are camped near Brandy Station, Virginia. Yours bearing date April 20th came safe to hand last night, you may bet, I was glad to hear from you and the rest of the folks in town, that you are enjoying good health, for myself and the rest of the boys are all fat and ragged and nasty as ever and can consume my regular rations yet. We have our regular four hour drill and a brigade dress parade every night to top off with. I tell you they are fetching us right to time this spring. I think the drills will play out in a few days and there will be some hard fighting. News is dull out here in the army, so you see I cannot tell you any. I suppose the Vets will relieve you some of your hard duty which you have had to do since the boys from the 5th have left, they are poor hands on such duty. I’ll send another picture for fear one will make you sick. The Chaplain fetches them round every Sunday morning for us to look at and think of the good times we had while we were here at home. It’s nice to know this soldier has someone writing to him and providing news from home. Lewis sounds cheerful and well adjusted to military life but senses the gravity of the up coming fighting he will participate in. He thinks of home. Shortly after this letter is written, his regiment does indeed begin a hard campaign that keeps the men on the move and fighting all through the spring. They participate admirably in a number of minor and major encounters with the enemy, including The Wilderness and Spotsylvania. Exactly what happened to Lewis in July of 1864 will forever be a mystery. One medical record shows Lewis was returned to duty on the 12th of July. His regiment is never informed of his release to duty because they continue to carry him on their records as absent, sick or wounded until the end of the war. Lewis says he was transferred to another hospital and then another until the end of the war. The War Department holds that medical records show he was returned to duty on July 12 and the regiment does not show he returned to duty on that date, so he is a deserter. Was he really returned to active duty or was the intention to discharge him into the invalid or reserve corp. If he was fit for duty why would one hospital transfer him to another? At some point, shouldn’t someone have figured out that he was fit for duty if he actually was? Do you believe the army could mess up? Of course not, they are infallible – right? This appears to be a case of mixed up or misunderstood paperwork. The Battle of Cold Harbor produced 9,000 wounded men between May 31 and June 12, and the war produced many more wounded before and after that date. We really can’t blame the medical personnel for not knowing what is going on with one individual or for losing track of some paperwork. Neither can we blame his regiment and company for not being able to track him through several hospital transfers over a period of months. The original 3 year enlistment of the regiment expired just four weeks after Cold Harbor. The regiment reorganized into a single independent battalion of three companies of veterans while the balance of the regiment returned to Wisconsin and mustered out. On July 12th, while the bulk of the regiment packs to head for home, a doctor makes a change in the status of Lewis’ condition – and the paperwork goes where? The regiment was immediately rebuilt after arriving home and 7 companies left Wisconsin to rejoin the veterans in early October. I’m sure all the paper pushers were very busy during all this. Still, you would think that over the course of the next year someone would inquire about Lewis. Each one of those months someone had to fill out a roll and mark him absent. I can’t believe the regiment officers didn’t insist on confirmation every now and then of Lewis’ status and whereabouts. Especially after the mix-up that led to his first desertion charge. Personally, I think the regiment knew where Lewis was through it all, “absent, sick”, just like their reports indicate. After the war ended and Lewis was recovered from his illness, he worked in Philadelphia for a while before returning to Wisconsin. Back in Wisconsin, he married Ruth Mariah Coyhis on 26-Sep-1869. They had a son, William B., born in 1868 according to unsourced information. It is unclear how long Lewis and Ruth were together, but it appears they divorced. She remarried, divorced again, and died in Wisconsin in 1916. The son, William, died in 1890 at age 22. In the 1880 Census, a Lewis Kindness is found as a laborer, white, age 38, born in NY, married, and living with Charles Wilson and family at Tompkins, Jackson Co., Michigan. His family is not found with him. It is possible this is the wrong man because the birth place given for both parents is recorded as England. In researching the Kindness family name I have discovered the surname is also Irish, so this may be an Irishman. I found a Lewis M. Kindness listed in a Kearney, Nebraska city directory as a laborer boarding with others. The year is 1890. I do not have enough information to know if this is my soldier. I have not found him in any other online records. Lewis remained in Wisconsin according to statements in his pension file. However, I have had no luck finding him in census or learning anything more. Lewis first filed for his pension from Chilton, Wisconsin in August of 1896. He received a letter back from the pension department stating his military status was “deserter” and so there would be no pension for Lewis Kindness. Lewis enlisted a local man to assist him in getting the charge of desertion removed from his record. On the 8th of October, 1897 Mr. Cronkrite wrote to the Secretary of War on behalf of Lewis. The War Department’s very curt reply offers no assistance or advice. Imagine that, a government that does not care about the problems of it’s veterans after they have been used up. Remind you of any other time in history? By 1900, Lewis is found in Stockton, Chautauqua Co., NY under the roof of his cousin, Laton Kanistanaux. He is listed as single, white, age 59, a general laborer with no education. Lewis appears to continue to struggle to support himself and begins a new attempt to get assistance based on his military service. He hires a Washington D.C. lawyer. He acquires a letter from General Geo. 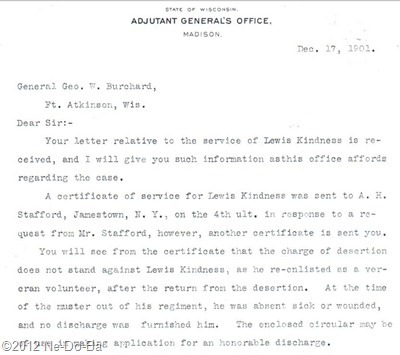 W. Burchard, State of Wisconsin, Adjutant General’s Office clearly stating that Lewis is not in their records as a deserter. In addition, he states Lewis is shown in their records as “absent, sick” at the time his unit mustered out, so was not present to receive his formal discharge. The pension department does some research and makes some notes which are included in Lewis’ pension file. They find records showing Lewis was wounded at Cold Harbor and forwarded to a hospital. When I look at these notes I also see the words “no desertion” and “state roster does not mention desertion” very clearly written. The note card is dated 25-Jan-1902. In late February of 1902, Lewis is admitted to the Chautauqua County Almshouse in poor physical condition and suffering from kidney problems. He is incapable of working and providing for himself. I have no record of how long his stay was. In December of this same year, 1902, Lewis receives a letter from the pension bureau “In response to your recent letter” stating they have no record of his pension application and include a blank application for him to fill out. They have lost his paperwork. Sound familiar? Mean while – the soldier still has basic needs not being met and continues to suffer! On the 2nd of June 1904, United States Postmaster, C.D. Payne, of Stockton, NY writes to the pension office on behalf of Lewis Kindness. He includes a newly filled out application form, Lewis’ certificate of service from the Wisconsin Adjutant’s Office, and other documents to support the application. In the past, Lewis has signed his paperwork with a mark. This time he prints his name. Postmaster Payne’s letter provides a complete picture of Lewis’ service and his most recent attempts to acquire a pension. He starts by explaining that a Washington lawyer has failed to accomplish anything and his local lawyer is incapacitated by “illness & brain trouble”. The situation has resulted in “an almost hopeless & unnecessary Complication”. The old man is feeble, & being incapable of self support is destitute, but as proud as he is honest, & deserves to have justice done to him. Another member of the pension bureau looks into Lewis’ service and makes a record of all the military and medical records that can be located for Lewis. This person keeps notes on a card found in the pension file. Those notes about Lewis’ record are found in bold in the list above. On the 14th of July, 1904 the Pension Bureau mails Lewis yet another notice his pension had been rejected. The reason this time, the War Department says he is not on record as honorably discharged from service. They are no longer claiming he is a deserter (at least not on this document), only that he does not process an honorable discharge. Well, I guess that is an improvement, but it still doesn’t get the man the help he needs. There is another document dated 1904 found in his pension file that states the cause of his rejection as “not having been finally discharged from the service”. This sounds like they are saying he can’t have a pension because he is still in active service?!? However, at another place on the same document it shows his discharge date as 12-Jul-1864 but the word discharge is crossed out and “deserted” is written in. So apparently they are still holding onto the idea he is a deserter. This despite the fact the Wisconsin Adjutant General provided Lewis with a formal certificate of service and a letter explaining he was sick in the hospital when his regiment was mustered out. Now the year is 1907 and Lewis once again fills out an application for his pension. The date is 22-Nov-1907. Lewis is 67, living on Route 41 in Sinclairville, Chautauqua Co., NY. He says he was born on 4-Sep-1840 at Brothertown, Oneida Co., NY. He states that after the war he lived at Chilton, Rock Co., Wisconsin until moving to New York about 12 years ago. Lewis does not sign his name to this document, he only makes his mark. He has witnesses named F.O. Waite of Sinclairville who has known Lewis 6 years and Clark Frank of Sinclaiville who has know Lewis 5 years. The card for this application is stamped “rejected” and “abandoned”. A February 1908 letter from the Pension Bureau once again says no pension for Lewis because he “has never been honorably discharged”. A scribbled letter of the same date states he deserted. In 1909 it appears Lewis (or his representative) is now resorting to asking for Congressional assistance in the matter. Lewis’ address is given as Brocton, NY. No formal congressional response is found in the pension file. Lewis is back living in Stockton when the 1910 Census taker makes his rounds. He is a 73 year old Indian man, single, and self employed. His occupation is “pedlar” of “Yankee notions”. What exactly are “Yankee notions”, you might ask? Google the term and you will find it as the title of a book from the 1830s and a humor periodical begun in the 1850s. But it this case we are talking about the occupation of peddling. A number of good resources are found describing Yankee peddlers and the Yankee notions they offered. A peddler often walked carrying his products on his back or had a wagon in which he traveled around the country side selling his goods. Yankee notions are described as items like pins, needles, hooks, scissors, combs, buttons, razors, brooms, books, window glass, novelties, small hardware and perfume. So here is Lewis, probably walking around the county-side carrying a load of goods at the age of 73. This would be taxing for any man of his age, but he has been disabled for more than a decade. He struggles to support himself, a horse that needs food and a stable would just add to his problems. Without a good cash flow, hiring a rig would likely be too expensive. The thought of Lewis walking and carrying his good makes me want to cry. Fast forward to December of 1912. Lewis is filing yet another application for his pension. This time he files from Calumet Co., Wisconsin. His address in RR1, Box 125,, Chilton, Wisconsin. He signs with his mark. His witnesses are Abram Denny and Mary A. Johnson, who have both known Lewis all their lives. I wonder how he got from Stockton, NY in 1910 to Wisconsin in late 1912? I hope someone provided him with traveling expenses and that he didn’t have to walk. Once in Wisconsin, I wonder if anyone took him in or if he lived alone? His brother died in 1909. Perhaps his sister-in-law or a nephew took him in. I can only hope that someone was kind enough to offer this man a roof over his head. On February 5th, 1913 the War Department writes to the Commissioner of Pensions. Application for the removal of the final charge of desertion standing on the records against Lewis Kindness, Company I, 5th Wisconsin Infantry Volunteers, has been denied and now stands denied under the law. The pension bureau informs Lewis on 3-Jun-1913, “No further action in your claim is warranted”. Essentially they are saying, stop bothering us. The evidence before this Department including the certificate of the Adjutant General of Wisconsin, and the affidavit of Kindness executed May 14, 1913, both herewith returned, does not warrant the removal of charge of desertion standing against Lewis Kindness on the records of the 5th Wisconsin Infantry. A letter dated 8-Jun-1914 states Lewis is “75 years old & Feable & almost Blind”. The response is predictable – you are a deserter and can have no pension. This is the most recent date in the pension file of Lewis Kindness. Since he never received his pension, there is no death date recorded in the file. I found no death date online. Caroline Andler is still looking in Wisconsin, but so far has come up empty. I very seriously doubt Lewis ever intentionally did anything dishonorable during his lifetime. But, I should let my readers form their own conclusions based on the information I have collected. Before you decide, take a minute to read what Lewis has to say for himself. I don’t know about you, but my heart breaks for Lewis every time I read this letter. The letter is undated but I believe he wrote it in 1904. This was the year Lewis signed his application instead of using a mark. Why was Lewis denied his pension? Many will say, because he was an Indian he was being discriminated against. This may be true. His race very likely didn’t benefit him and his illiteracy certainly did complicated his situation. However, I am inclined to believe it was the desertion charges that really did cost him his pension. Even though the charges are probably false and should have been corrected, it appears to the War Department he deserted, not once but twice. Once can be a mix up, but twice perhaps suggests to them a habitual offender. I have read enough pension files to know that charges of desertion were common. There are plenty of men that did intentionally desert. There are also a number of desertions that resulted from poor communication and/or poor record keeping. I also know desertion charges can be reversed with the proper paperwork, testimony of fellow soldiers, and a good advocate working for you. It appears Lewis received none of these items. Despite the fact his regiment and the State of Wisconsin held no grudge against him, the U.S. Government did. Lewis’ last known address was Chilton, Wisconsin. I can only assume that Lewis lies in an unmarked pauper grave nearby. He perhaps died in the year 1914 or 1915. If the grave is unmarked, there is little hope of a military marker. No recognition what so ever of this man’s service to his country! No final honor for this soldier even in death. A terribly sad ending for a man who only wanted to be a good Christian during his life time. For my part, I am proud to have met Lewis Kindness and honored he chose me to tell his story. Wikipedia – the regiment history, descriptions of various battles and events, etc. Please let me know if you meet Lewis in your travels!